Counterpart’s Bridge of Support program at Sunshine Hospital was officially launched on Monday 23 May, by Member of the Legislative Assembly for St Albans Natalie Suleyman. Western Health CEO Alex Cockram hosted the event, and LUCRF Super CEO Charlie Donnelly, Counterpart Manager Lee Kennedy and Western Health Senior Consulting Oncologist Dr Shirley Wong, all said a few words. Coralie, a Counterpart Peer Support Volunteer from the Western suburbs who underwent her treatment for breast cancer at Sunshine Hospital, spoke about her experiences both as a patient and as a Peer Support Volunteer. Women’s Health Victoria Board Chair Meredith Carter closed the formal proceedings, thanking LUCRF Community Partnership Trust for funding the two year project, and acknowledging the hard work and dedication of all those involved. 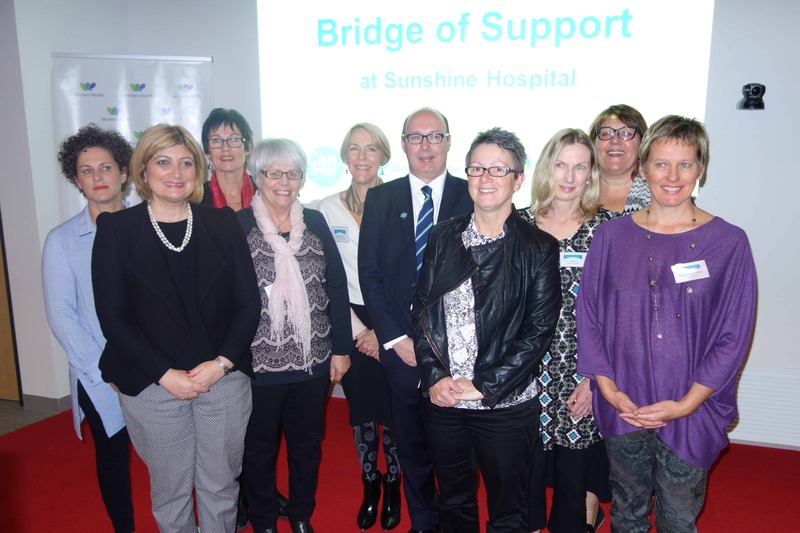 Bridge of Support at Sunshine Hospital is based on the successful Bridge of Support program that has been running at the Royal Melbourne Hospital since 2010. Through the program Counterpart, in partnership with Western Health, brings volunteers who have had a breast cancer experience into the hospital to provide emotional and practical support to women going through treatment.